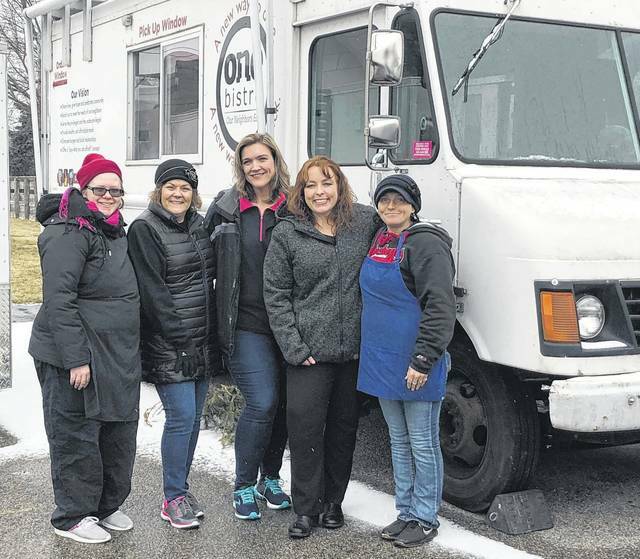 Scott Halasz | Greene County News Bourbon Bayou Bistro owner Jennifer (far right) along with her support system of Denise Davis from One Bistro, and customers Melissa Walters and Liz Dillon, pose in front of the One Bistro food truck. That food truck was sold to Jennifer to help her keep her business on North Detroit Street going. XENIA — She was about to shut down her business and had gone so far as to post it on Facebook. “I was literally ready to give up,” said Bourbon Bayou Bistro owner Jennifer. She’s not using her last name due to some issues in her past and time spent in addiction recovery. “I sat here (one day), I had six customers,” she said of her tent-based restaurant on North Detroit Street in the parking lot where Stan the Donut Man once was. “I’m not going to make it like that.” A multitude of bad experiences, accented by some less than scrupulous business associates led Jennifer to the brink. But then it was like a miracle happened and she began to receive a “hand up” from the entire Xenia community. And now the forty-something mother of three owns her own food truck — thanks to One Bistro — and is putting finishing touches on remodeling the donut building, which will permanently house the Bistro, meaning no more parking-lot tents. “It’s been so much better,” Jennifer said of business since that social media post was made a couple months ago. She made $164 the day before the post. The day after she doubled it. But Jennifer is no longer looking back, only forward thanks to the amazing support system she has in place. It started when regular Bayou customer Melissa Walters took over Jennifer’s Facebook page. A gofundme.com page was started and all the social media buzz caught the eyes of One Bistro Board President Denise Davis and Treasurer Diane Dixon. They agreed on a price — despite other offers for more money — and Jennifer made the purchase. So instead of being out in the elements, she can be in the food truck until the building — which she purchased on land contract — is ready. That’s been Jennifer’s motivation the entire time. Everything she has done — venturing out on her own to open a business, staying clean in rehab, and working in all kinds of crazy Ohio weather — has been for those three kids, the oldest being just 16. Neither do Walters and Liz Dillon, another restaurant patron who has helped along the way. Nor the folks at One Bistro. Or the well-known Xenia Boys, who helped Jennifer with demolition inside the building. Jennifer expects to be able to occupy the building in the coming months, once all the code violations are fixed. Then she will actually have three avenues for her business. The building itself, the food truck — which will go to festivals and events — and her current tent, which received another year of certification and can go to events as well. Bourbon Bayou Bistro is open 11 a.m. to 8 p.m. daily during seasonable weather and 12 p.m. to 6 p.m. other times as weather allows. https://www.xeniagazette.com/wp-content/uploads/sites/32/2019/04/web1_Bourbon-Bistro-2.jpgScott Halasz | Greene County News Bourbon Bayou Bistro owner Jennifer (far right) along with her support system of Denise Davis from One Bistro, and customers Melissa Walters and Liz Dillon, pose in front of the One Bistro food truck. That food truck was sold to Jennifer to help her keep her business on North Detroit Street going. Contact Scott Halasz at 937-502-4507. Follow @xeniagazette on Twitter.